If NBA general managers could go back in time, the 2011 draft would look a lot different. With a class full of All-Stars, how would it play out with a do-over? What would happen if we gave NBA general managers a weirdly specific, five-year-only time machine? I would like to think that they would go back in time to correct their worst personnel mistakes, though it’s also possible we create a Back to the Future situation and kick off some kind of gambling scandal instead. If GMs did use the time machine for the right reasons though, how different would the NBA landscape look right now? Well, we’d have to start at the 2011 draft, which featured plenty of future All-Stars, as well as a number of bad players who were selected before great ones. Let’s have some fun and re-do the 2011 lottery, and together we can imagine a world in which scouting is a science and not a blind dart throw. 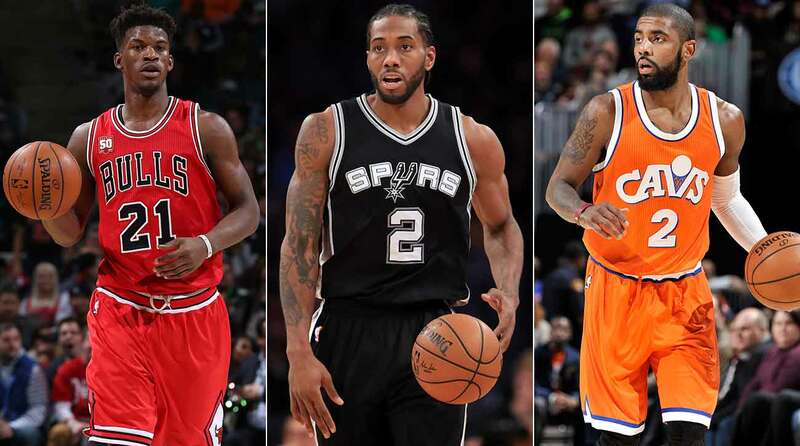 Kawhi Leonard or Jimmy Butler? Klay Thompson or Kyrie Irving? The right answers to these questions could have really changed the direction of the NBA. The Bulls got an absolute steal with Butler at the end of the first round in 2011, as the Marquette product has turned himself into the second–best player from this class. Butler made his mark on the defensive end early in his career, but he’s since turned into a bona fide No. 1 scoring option. The Timberwolves would really love a do-over on this pick, as Derrick Williams never really panned out for them. Selecting Butler in 2011 would have really changed the course for Minnesota, who would have had an intriguing two-man combo of Kevin Love and Butler. This is really where you have to start splitting hairs. I have Klay Thompson getting the nod over Kyrie Irving here because I think Thompson is a slightly more complete player. It’s a little difficult to judge both players in a vacuum because they both play for great teams, but those pre-LeBron, Kyrie-led Cavs teams were just bad enough to give Thompson the leg up. In this scenario, Thompson would team up with Gordon Hayward to give the Jazz a formidable perimeter duo. I’m also really curious about this alternate reality because Klay would have a larger role on almost every team besides Golden State. Would Thompson be able to carry a team offensively like a true No. 1 option? Sometimes I wish we could find out. How about that? Cleveland still ends up with Irving, and pairs him with Kawhi instead of Tristan Thompson. If LeBron still comes home three years later—and at that point, why wouldn't he?—the Cavs probably have an even better team than they do now. The only thing I worry about is Kawhi and Kyrie getting along. Leonard is almost too perfect of a fit in San Antonio, where it is practically news when he smiles. He wants to shy away from the spotlight. Then again, I could also see Kawhi going to Cleveland and winning an Emmy after a memorable supporting role in an Uncle Drew commercial. Leonard would probably never want to take off his disguise. Instead of taking center Jonas Valanciunas, the Raptors go with a point guard in Kemba Walker. The UConn product has really elevated his game the last couple of seasons, and he’ll likely represent the East again in the All-Star Game in February. I’m really into the pair of Walker and DeMar DeRozan, who was selected by Toronto in the 2009 draft. Walker’s clutch heroics could have really come through for Toronto in playoff time, and it’s possible the Raps have more substantial playoff runs if they had nabbed Kemba five years ago.​ With Kemba in town, Toronto probably never acquires Kyle Lowry, who joined the Raptors in 2012. Does Lowry still blossom into an All-Star somewhere else? The Kings are saved by the Hornets, because Sacramento would have absolutely selected Valanciunas if he fell to 10, thus angering Boogie Cousins by taking a center in the lottery. Instead, Sacramento picks Reggie Jackson, who probably doesn’t get along with Cousins either. Jackson’s reputation as a teammate took a hit in Oklahoma City, and his shoot-first style could have been an awkward fit with Cousins. Either way, this pick is better than the reality, which is Sacramento pinning their hopes on Jimmer Fredette.